Green dip pen with cork grip, manufactured by the American Pencil Company. 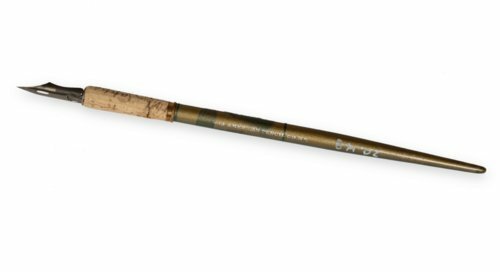 Kansas Governor Arthur Capper used this ceremonial pen to sign the "Bone Dry Law" on February 23, 1917, effectively banning alcohol in Kansas. Passed by the Kansas legislature days prior, this law prohibited the possession of liquor by individuals within the state, and ended direct shipments of liquor from out-of-state. Kansas established multiple laws restricting or prohibiting the sale of alcohol from 1880 to 1948. The state's early and lengthy regime of Prohibition lead to some of the most restrictive alcohol laws in the nation. After signing the bill into law, Capper awarded the pen to Mrs. Lillian Mitchner, President of the Kansas Woman's Christian Temperance Union (WCTU), in recognition of her work. A resident of Beloit, Kansas, Mitchner later donated to the pen to the Kansas Historical Society.